Dharavi, India: The Most Entrepreneurial Slum In The World? If you've watched the opening scenes of Slumdog Millionaire, you've seen Dharavi, a teeming slum of nearly a million people in the heart of Mumbai. I'm just back from India, including a visit to Dharavi. And, let me assure you, the film was shot on location. Walking into the slum from Mahim Link Road, poverty slaps you in the face. Ramshackle buildings made of a mélange of found materials and corrugated tin line unpaved passageways. Open sewage runs through the alleys, collecting in puddles alongside playing children. There is only one public toilet per approximately 1,500 residents, and most families have neither the means nor the space to have a private bathroom. So, the site of kids relieving themselves in public fields is depressingly common. But at second glance, the slum is more intriguing and--much more encouraging. Despite the low education levels, substandard housing, and intense overcrowding, Dharavi is a veritable entrepreneurial hotspot. 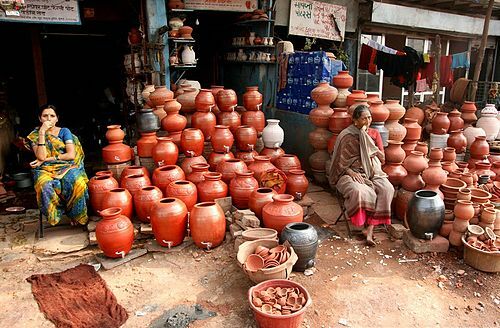 Two women sell pots in Mumbai. I had the opportunity to take a tour through the area with a local guide who showed us a sampling of the various enterprises. Befitting India's industrial heritage, there are a large number of small garment manufacturing shops in which men and women work sewing machines and do hand finishing work. Weaving and embroidery businesses are clustered nearby. Far less expected is the number of recycling businesses. For such a dirty place, Dharavi is a mecca of "clean" industry. If a product can be reused, someone is probably recycling it there. Plastic comes in myriad forms from all over the Mumbai region. Scores of workers sort the plastic into different types and colors and use machinery that is produced in the slum to process plastic pellets and plastic wire. These pellets and wire are then sold in bulk back to larger industrial users in India. Industrial sized cooking oil tins arrive by the truckload on a daily basis to be scrubbed, sanitized (frighteningly, often by someone hand-dipping the can into a boiling vat of water), and reshaped before a return trip to local food processors. Computer keyboards sit in large piles, waiting to be picked apart to sort the plastic from the metal parts that get sent to different recycling facilities. The Guardian reports that in all, Dharavi has an estimated 5,000 businesses and 15,000 single-room factories that produce somewhere between $700 million and $1 billion a year in revenue. As these businesses continue to expand, Dharavi has become a community linked and supported by entrepreneurship. The local businesses are providing small but significant income improvements to tens of thousands of families. Electricity, running water and televisions are now available to an increasing number of households. But where do the majority of the increased incomes go? According to our tour guide, most families use the money to pay for private school education for their kids. Often illiterate parents are making an investment in the future. And local entrepreneurs are developing schools that far surpass the quality of local public education. Dharavi may not change much in this generation, but the power of entrepreneurship offers great hope for the next.